How could I not take advantage with full size eyeshadow pigments reduced down to $2.50 each? 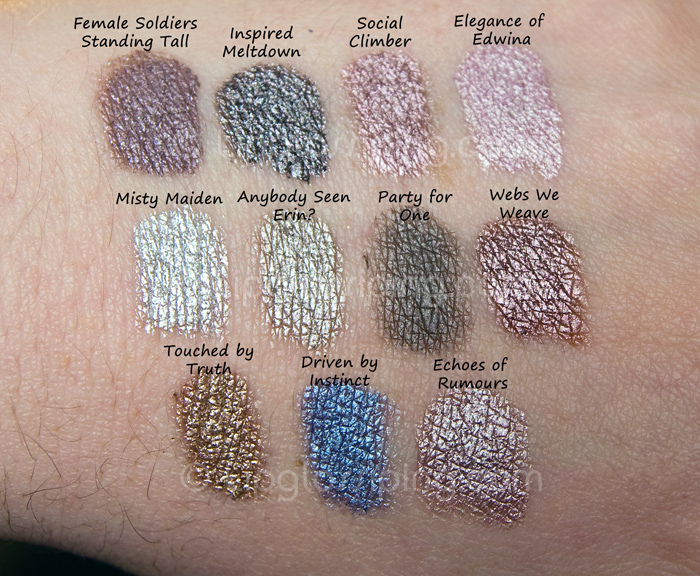 Stand out shades are: Female Soldiers…, Inspired Meltdown, Anybody Seen Erin, Touched By Truth. Those 4 blow me away by how achingly beautiful and unique they are. Driven by Instinct was described as a “smoky purple shimmer” but unfortunately, it just looks blue on my skin. A lovely shade nonetheless, but blues don’t really suit me. Shipping time from The She Space is *always* slowwww. I ordered on 20th October and it took very nearly a full month to arrive. Are you into your pigments? I’m hoping to press these when my pans arrive from Hong Kong – I don’t know how they’ll turn out, but I’ll share my method and results! The She Space Holiday sale has now kicked in and full size pigments are reduced to $3.50 each from $4.50. Omg I love so many of those! Think my fave is Webs We Weave, but they’re all really lovely. MUST wait til payday!!! I’ve got a huge load of She Space pigments and shipping has always been slow. I ordered this weekend and I know it’ll be well into December before I see it but her pigments are just so beautiful and unique that I don’t mind too much! You chose some gorgeous shades. Beautiful! I have never heard of that site, but I probably shouldn’t open Pandora’s Box (the link, that is) until I get paid. @RedTiger21 – Im so happy with them! It’s amazing how many looks we can create with such a small outlay! @Leanne – It is just a bit too slow isn’t it? 2 weeks is fine.. but getting on for a month, geez the time drags! @Sirvinya – Pigment Queen! They are unique aren’t they? I have such a hard time narrowing down my choices when I get on the site!